The people who led the change of parties in the South ... was my generation. My generation who went to integrated schools. I went to integrated college -- never thought twice about it . . . . by my time, people realized that [segregation] was the past, it was indefensible, it wasn't gonna be that way anymore. So the people who really changed the South from Democrat to Republican was a different generation from those who fought integration. Salon's Steve Kornacki calls this "utter nonsense." Washington Monthly's Steve Benen chimes in that Barbour's comments are "so wildly ridiculous, it bears no resemblance to reality." Eugene Robinson refers to this as a "fairy tale" view of history, and reminds the reader of numerous potential inconsistencies in Barbour's story. All three hint at the establishment view of Southern Realignment: that the South suddenly realigned around 1964, largely as a result of President Johnson's Civil Rights Act of 1964 and President Nixon's infamous Southern Strategy. In a way, Benen, Kornacki and Robinson are bashing a straw man. Barbour's argument is about what motivated the generation of Southern politicians that rose to the stage in the 1980s and 1990s. Benen, Kornacki, and Robinson respond that this is nonsense, and that the Great Realignment of 1964 was based on race. There's no real tension between these views. Regardless, we'll look at both arguments. The Southern realignment was much more complex than a simple race-baiting strategy hatched in Nixon Headquarters in 1968, and it certainly didn't have "everything to do with race," as Kornacki claims. This is not to say that race didn't play a role - it absolutely did. Nor is it to deny that the Republicans sometimes exploited (and still exploit) racial issues to motivate voters (as do Democrats). 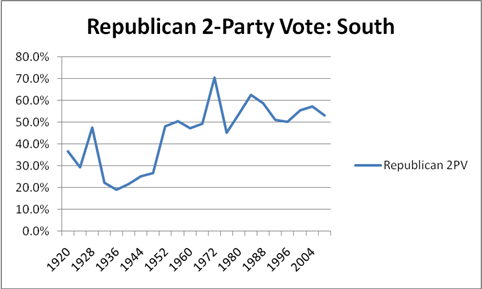 It shows the Republican share of the two-party vote for President (clear Democratic splinter groups like the Dixiecrats are still counted as Democrats) in the South. I also ran the chart separately for the Deep South - AL, AR, GA, LA, MS and SC; it looks roughly the same. 1968 is not included because George Wallace's candidacy makes it impossible to apportion votes correctly. The South made clear that it would not reflexively back nominees that were too liberal, urban, and ethnic as early as 1928, when the Democrats nominated New York Governor Al Smith, a liberal Catholic from New York City, and Republican nominee Herbert Hoover came 7,000 Alabama votes away from carrying a majority of states from the Old Confederacy. He won 47.6 percent of the South's popular vote. The Great Depression set Republicans back, but post-1948, Republicans began seriously working to pick the Democrats' lock on the South. In 1952, Eisenhower carried three Southern states. In 1956, he carried five, including deep Southern states like Louisiana (pace Benen). Eisenhower came 15,000 votes in North Carolina from carrying a majority of the Southern states; he managed to carry a majority of the South's popular vote. And the days of Republicans receiving 5 percent of the vote in Deep Southern states were by then over. Eisenhower received at least one-third of the vote in every state in the Old Confederacy. The same is true for Nixon in 1960, when the pro-Civil Rights Nixon, who, as Kornacki observes, was representing an Administration that enforced Brown v. Board, carried Virginia, Tennessee and Florida. Texas, North Carolina and South Carolina were all decided by five points or less. Without LBJ as the Veep candidate, Nixon may well have carried those states - indeed Republicans picked up their first elected Southern Senate seat in history in a 1960 special election shortly after the election. In 1964, Goldwater did break through in the Deep South. But compared to the preceding decade, that isn't all that surprising. Goldwater ran roughly even with Nixon in Arkansas, Florida, North Carolina, and Virginia. He ran about ten points better in South Carolina, Tennessee and Texas. On average, he ran two points ahead of Nixon. Compare this with 1952, when Eisenhower ran 22 points ahead of Dewey in the South. I hear you saying, "yes, but the country was lurching toward the Democrats. Only the South (plus Arizona) stuck with Goldwater." This is true. Consider how the South performed, on average, compared to the rest of the nation over the same time period. This chart shows the Democrats' share of the popular vote, compared to the nation as a whole. So, for instance, in 1936, the Democrats ran about 18 points better in the South than in the rest of the country. 1964 and 1972 are clearly off the general trendline. But they're still roughly consistent with that trendline; there's no sharp departure. And there's a bit of a chicken/egg debate to be had here. 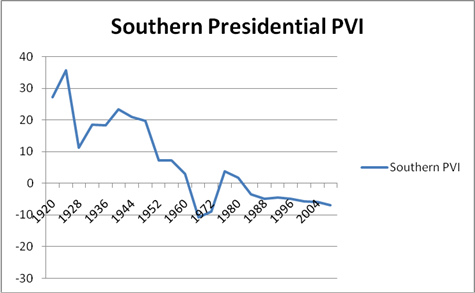 Did the South depart from the trendline over Civil Rights? Or did the South stay on trend, while the rest of the nation lurched leftward in reaction to Goldwater's anti-Civil Rights stance? To further explore the reasons for this shift, we need to examine Congress. Consider the following maps. This first map shows all Congressional districts in 1930 by the Poole-Rosenthal First Dimension DW-NOMINATE scores of these districts' members. I won't get into too much detail (unless you want a lecture on matrices and vector mathematics), but these scores are basically the result of a program that looks at all votes in Congress, and filters out the ones related to racial or social issues, leaving us with votes cast on purely economic issues. A dark blue district has a relatively liberal member, while a dark red district has a relatively conservative member. In 1930, the Southern Democrats are pretty solidly aligned against Northern Republicans. But as more liberal Northern Democrats began to pervade the Democratic caucus in the 1930s, and as FDR embraced increasingly strong state interventions in the economy, these Southern Democrats became increasingly uncomfortable with the national Democrats. As my former colleague Jay Cost wrote in a piece addressing the same pair of articles, this was the result of "an intra-party economic cleavage centered around issues of labor and wages . . . it has to do with race - just as many things in the South do - but race was not the central point of this particular conflict." Look at how much the South has changed! By now its members have voting records that are almost completely purple, and some areas in Texas, Louisiana and Mississippi are more red than blue. These latter Congressmen were already voting more with Republicans than with Democrats, six years before the Democrats became intertwined with Civil Rights. And remember, we're purely looking at economic votes here. By 1962, the Republicans were pretty routinely winning Southern states in Presidential elections, and there were twelve Republicans from the South: two in Texas, two in Virginia, four in Tennessee, two in North Carolina, and two in Florida. But that doesn't explain the "redness" of many of the Southern districts. At this point, a near-majority of Southern Democrats had voting records that placed them on the right side of the ideological spectrum, even excluding civil rights votes. In other words, by 1964, most Democrats were already voting like Republicans on non-racial issues. On a blank slate, these Democrats would be Republicans; they were true DINOs. But three things kept these Democrats from actually calling themselves Republicans: Jim Crow, seniority and Herbert Hoover. This is why we see such little change from the general trend post-1964, even with the end of Jim Crow's strange career. Republicans picked up a few Congressional seats. J. Strom Thurmond became a Republican, and a few other prominent Democrats followed suit. But the Southern Congressional delegations continued to be dominated by Democrats. Almost all of the signatories to the Southern Manifesto remained Democrats until they left Congress. Some, like Russell Long and John Stennis served as Democrats into the 1980s. When Haley Barbour ran against Stennis in 1982, he lost by a nearly 2:1 margin. George Wallace was elected Governor of Alabama as a Democrat in 1982. Richard Nixon walloped George McGovern in the South, but this was hardly exclusively about race -- McGovern was to the left of you average Southern voters on just about every issue imaginable. Four years later, Jimmy Carter was still able to carry every Southern state except for Virginia in 1976. As late as 1988, the South was still considered something of a swing region (the reason that Lloyd Bentsen was included on the ticket). Bill Clinton carried four Southern states in 1992, and came within five points of carrying four others. Republicans didn't make real progress in the Congressional delegations until the 1990s; even then the transformation continued into the 2000s. So why did the South finally become Republican in recent years? As Barbour explains, attrition. The Democrats weakened the seniority system in the 1970s, reducing the clout of the old bulls. Many retired. Some lost primaries, as newly-enfranchised blacks and poor whites flexed their muscle. And Democrats who remembered the Great Depression and for whom voting for a Republican was simply unthinkable absent a thoroughly unacceptable Democrat, were literally a dying breed by the 1970s. These Democrats also happened to be the ones who fought desegregation, while also fighting their national party on almost every other issue. By the 1980s, they were outnumbered by young people like Barbour, who were ideologically sympathetic to the Republicans (as were their parents and grandparents by this point), but also typically as well-off as their Northern middle class counterparts, and didn't have any great partisan attachment to the Democrats. Now, the Washington Post's Eugene Robinson makes some convincing arguments that someone like Barbour probably didn't attend a desegregated school (though I would imagine Barbour's memory of his schooling is better than Robinson's), and Ole Miss was hardly integrated while Barbour attended, though he matriculated three years after Meredith and after the school stopped rioting. But Barbour was only the leading edge of the broader Baby Boomer generation. Even with Barbour, it is hardly unthinkable that he, and many of his peers, accepted integration throughout his adult life. Regardless, it is indisputable that it was his generation, and not Thurmond's, that finally changed the political complexion of the South. Did race still have something to do with it? Almost certainly. But you also can't ignore that the South was by that point aligned with the national Republican Party on a wide expanse of issues relating to taxes, anti-communism, school prayer, abortion, the counterculture, Vietnam . . . the list goes on. Chalking everything up to the Civil Rights Act is overly simplistic, to the point of being incorrect. The movement of the South toward the Republicans is not a story of a rapid realignment brought about by LBJ's actions in the race debates of the 1960s. It was a slow, century-long process that began before LBJ was elected to Congress, that is still unfolding today and that, while driven in part by race, most certainly did not have "everything to do with race."